My friend and relative, Sonia Vent, shared about her experience of sewing a ruff made out of rabbit and marten fur. The ruff is for her granddaughter’s parka. A ruff keeps people’s face warm when they have it on a hood. 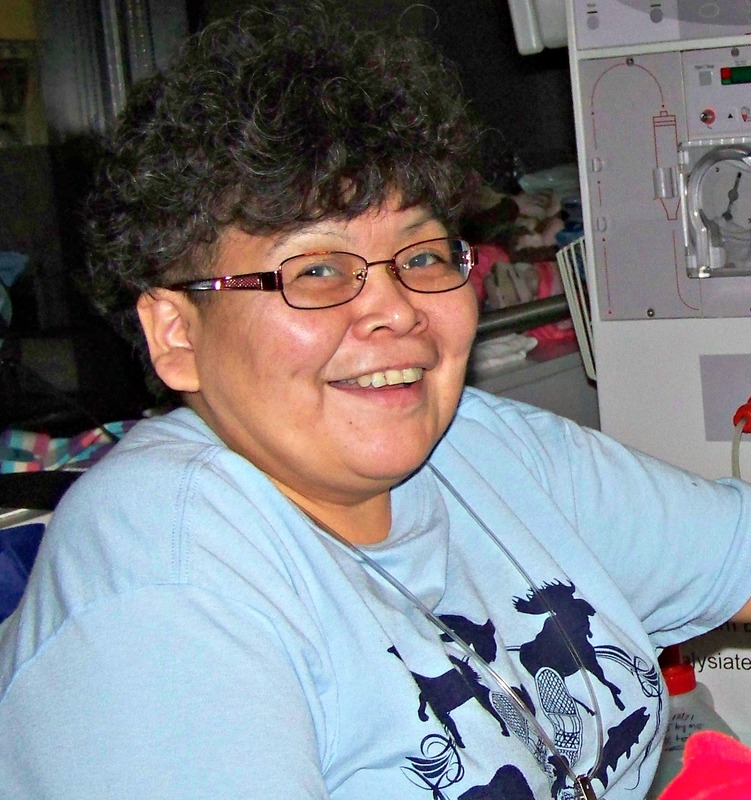 Sonia is Koyukon Athabascan and is from Huslia. Her parents are Freddie and Lorna Vent of Huslia. Sonia’s experience of sewing a ruff reminded me of my journey for beading and sewing slippers/moccasins for the past year. Taking up a cultural practice can be a spiritual experience. That little knowledge we have is powerful enough to connect us to our culture. I have found beading and sewing to be healing. Learning and practicing our culture is important. She graciously agreed to share her experience. Here it is below. 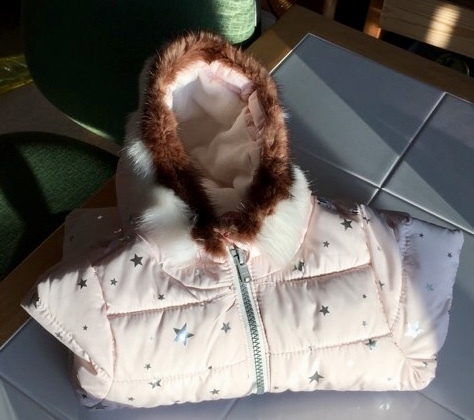 “I made a little rabbit marten skin ruff for my granddaughters’ parka. While in Fairbanks I rummaged through my mom’s furs, skins, and patterns helping her to both find and organize things. I had planned to make a ruff for my GD’s parka before then. 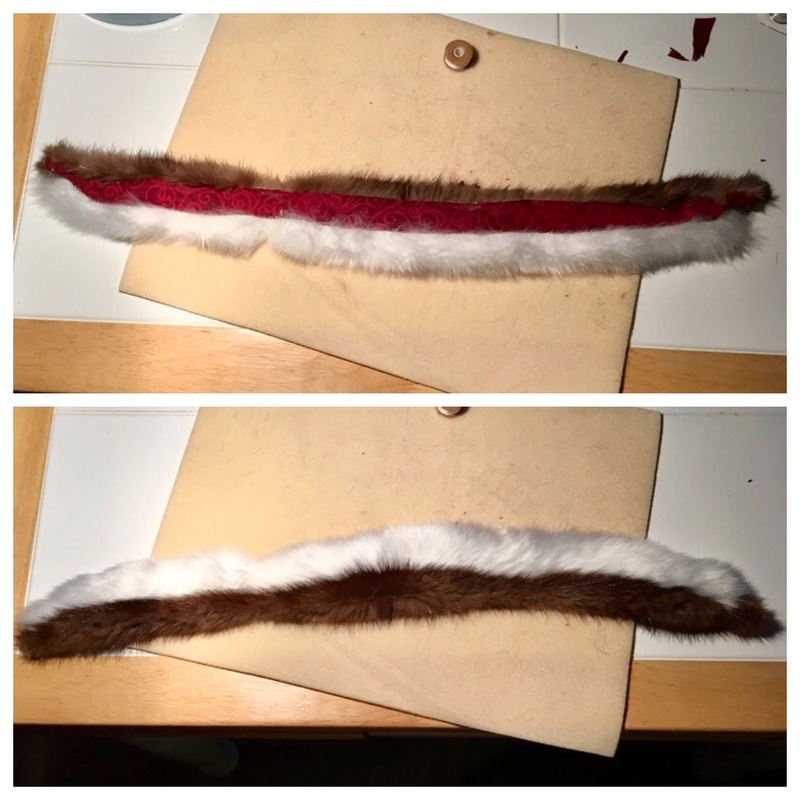 My mom had some already cut strips of rabbit fur amongst her things which she offered for me to use. She also had a piece of marten skin that was part of something else that she said that I could have. Ana basee’ ena’aa (thank you so much, dear mom)! What I discovered in skin sewing is that it takes a lot talent and expertise to turn out a well finished product. The fur has to be cut in a certain way so that one does not cut into the fur and the cut is only through the skin. My mom showed me a special way that she holds the fur as she cuts through the skin. Despite her now shaking hands she managed to do it like a professional. Measurement must be adhered to in order for the pieces to come together and for it to match up with the garment that it will go on. The sewing through the furred skin takes skill and talent otherwise the fur can be pulled through the skin along with the sinew or thread. It is important to find the “sweet spot” to sew through so that the seams are even and clean. I’ve also discovered the best light to sew in is daylight. Daylight is naturally bright and clear. I love the daylight! As I worked on the ruff, I thought of my many relatives and ancestors who worked night after night to make new garments for their families to wear at for the different community gatherings and holiday events. Skin sewing with our people was done out of necessity and love, especially love. I envisioned mothers sitting by a low-lit lamp working into the wee hours of the morning to finish a product for a special event so their children would have perfectly sewn clothing for the Christmas Program, that husband may have a nice wolf ruff to wear to the Winter Memorial Potlatch or that young son or daughter may have new kakkanaa’ (fur boots) to wear during the snow shoe race. I asked Sonia if she has any advice for people who are considering trying to do skin sewing. She recommends finding an experienced mentor to learn from. I can see how that would be important. Her mom, Lorna Vent, is a master skin sewer and beader. I remember learning how to bead barrettes and kkaakene (fur boots) from her at Johnson O’Malley classes at the school in Huslia. Sonia recommends gathering up the supplies needed for your project. She says, “Consider what furs will be used for project. Some furs are not recommended for certain gender.” That’s where an experienced mentor can guide you. Sonia recommends being aware of your posture and repetitive motions. She says, “Holding a position too long it can create a real problem in certain body parts. Practice timed breaks and movement will prevent body ailments.” I know when I’m beading and sewing, I stay aware of ergonomics. Sometimes, my shoulders and wrist hurt after a long session. Enaa baasee’ to Sonia for sharing her experience! I challenged readers of the Athabascan Woman Blog to help me come up with some one-word writing prompts. The prompts will help inspire me throughout the year. My goal is to do one blog post a week. Worpdress’ daily one-word prompts is originally what inspired me. I thought it would be great to make the words more related to Alaska or Alaska Native people, culture and more. I hosted a giveaway for you all to help me. Thank you to all who participated! The first word is k’eyoge’. Thank you to Margaret David for suggesting the word. 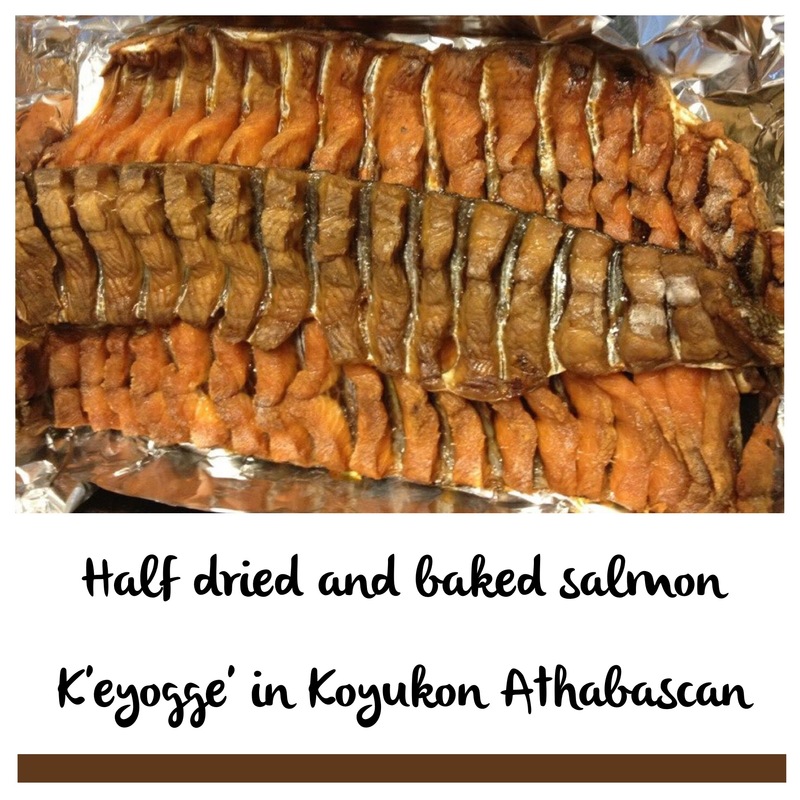 K’eyoge’ means half-dried fish in Denaakk’e (Koyukon Athabascan). I spent my summers in fish camp along the Koyukuk River near Huslia, and we were fortunate to catch, cut and smoke a lot of fish. We would smoke the eating fish in a smoke-house. 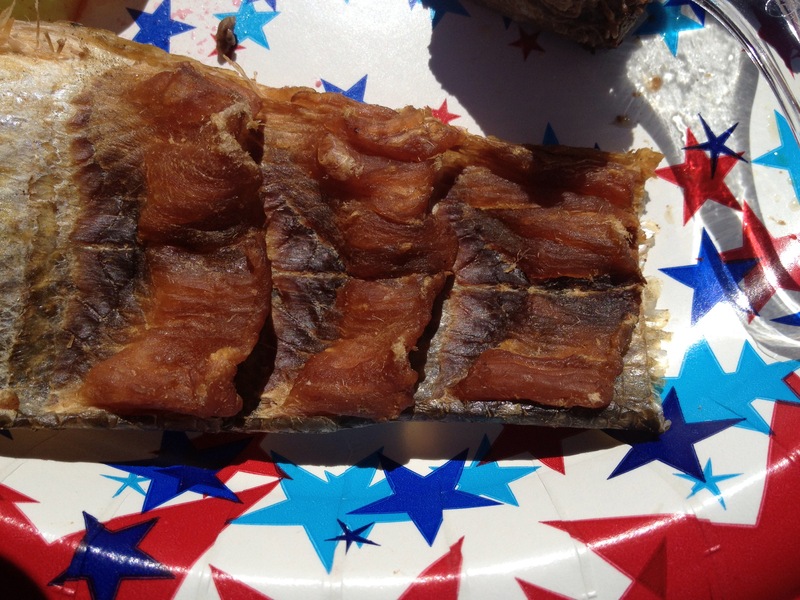 Half-dried fish is exactly has it sounds. We smoke it until it is half-way dried, and bake it or put it in the freezer. Have you eaten k’eyoge’? I am very grateful when I get to eat some. Sometimes potlatches are the only place to get it. Check out Susan Paskvan’s Athabascan word of the week article on cutting fish on the Fairbanks Daily Newsminer. 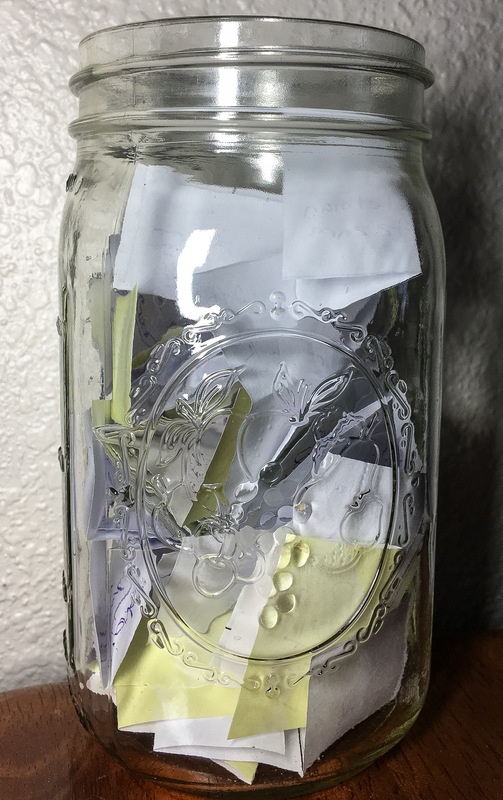 Do you have a word you would like to me to add to my suggestion jar? Comment below or send me a message on my Facebook, Instagram or Twitter pages. Be sure to like the Athabascan Woman Blog on Facebook for future giveaways. 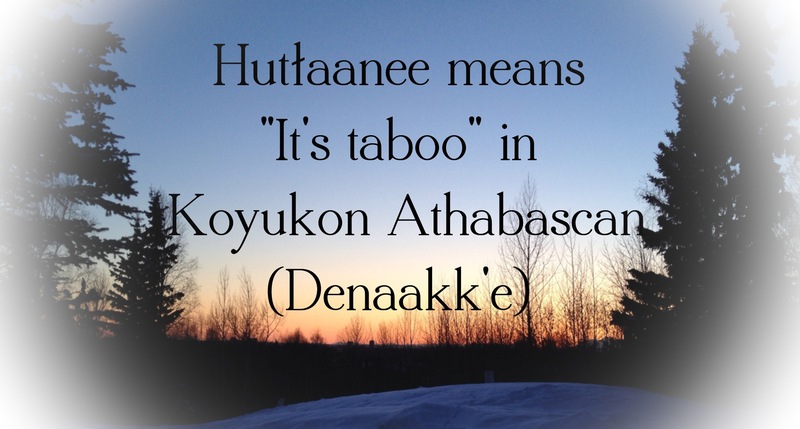 Hutłlaanee mean “its taboo” in Denaakk’e or Koyukon Athabascan. I grew up learning this at a very young age. I learned what was hutłaanee from mother and late grandmother Lydia Simon of Huslia. There are many traditional beliefs to follow and if you break them it is often times hutłaanee. Koyukon Athabascans survived thousands of years with their strong belief systems. My aunt, Irene Henry, recently pointed out one belief. When you go hunting, you don’t say, “I’m going out hunting.” We usually say we are going out or going for a boat ride. We don’t want to assume we are going to get lucky when going out hunting. We don’t want to give ourselves bad luck or wish anyone else bad luck. When we go to a new place, we burn a tiny amount of food as a small offering and prayer. This is called anthła (not sure about the spelling). Many of beliefs are unspoken. We believe in them so strongly, we don’t talk about them too much. My children in Anchorage don’t know as much about what is taboo. One belief I have shared with them is that woman and girls are not supposed to say the word bear, talk about it or eat it. I’m breaking the belief to share it and sometimes I just have to say it in the city. We refer to it with other words if necessary. It is hutłaanee when we say it. That particular animal is a powerful being. I respect the beliefs. When we drop food, we say ana’sa baaba (not sure how to spell ‘ana’sa’). The phrase is like saying, precious food. A long time ago, there were starvation days. Athabascans had to preserve food and couldn’t afford to waste even a little bit. We have to respect food and take care of it. If we drop food without saying ana’sa baaba, then it could be considered hutłaanee. I still say the phrase automatically when I accidentally drop food. I might whisper it to myself in a public place in the city, but I still say it. There are many beliefs that I learned growing up in the village. Some are harder to explain and follow than others. Some make sense. Some of them are easier to understand if you speak Denaakk’e. I practice the beliefs and traditions as much as I can, but I know there so much I don’t know. I better get researching. The Spirit of the Wind movie is being re-released this year and will be available for purchase on DVD! 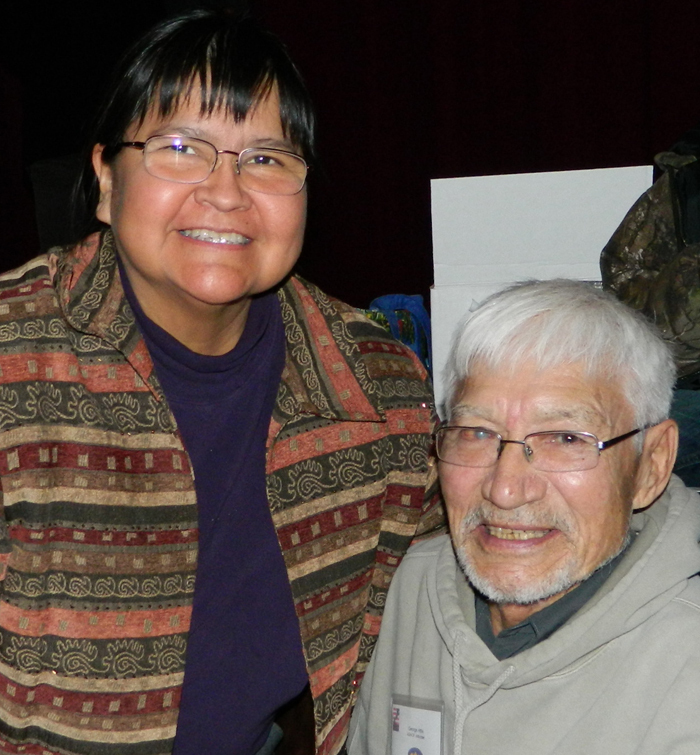 The movie is based on the life story of Athabascan dog musher, George Attla, Jr. of Huslia. Attla was able to overcome tuberculosis and win many dog mushing races, including the Fur Rondy sprint races. Attla has left his mark as a dog mushing champion through hard work, dedication, staying focused, staying competitive and overcoming obstacles and challenges. He is my dad’s uncle, so I’ve heard a lot of dog talk over the years. Attla is revered and respected by people all over Alaska, US, Canada and even beyond. The Alaska Native Heritage Center will hosted a re-release event for the movie in conjunction with the 2014 Fur Rondy. A reception with refreshments, a special screening of the film, and for the first time a limited number of DVDs will be on sale to the public at this event! While you won’t be able to buy it in Anchorage, you can buy it from Jade Resale Boutique in Fairbanks (729 1st Avenue, phone 907-479-5233). Jade Resale Boutique is owned by George Attla’s granddaughters. I enjoyed hearing Martin Buser’s story about George Attla, Jr. 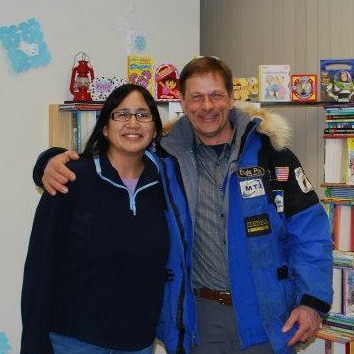 I met Iditarod musher Martin Buser a couple of years. It seems like whenever I say I’m from Huslia, people have stories to share about George Attla. Martin said he has learned some of the most important dog mushing lessons from George in the fewest amount of words. Martin visited George once and complained about the dogs not listening to him and running off the trail, etc. George said, “Who’s driving?” Martin said that was an important lesson for him. Yep, that’s a great lesson! It will be great to show this classic movie to my children so they can see what it was like to grow up in interior Alaska in Athabascan country. Attla continues to race occasionally. He helps to run a Frank Attla Youth & Sled Dog Care program in memory of his late son. Through the program, he is able to pass on his knowledge and lifelong experience to the younger generation. 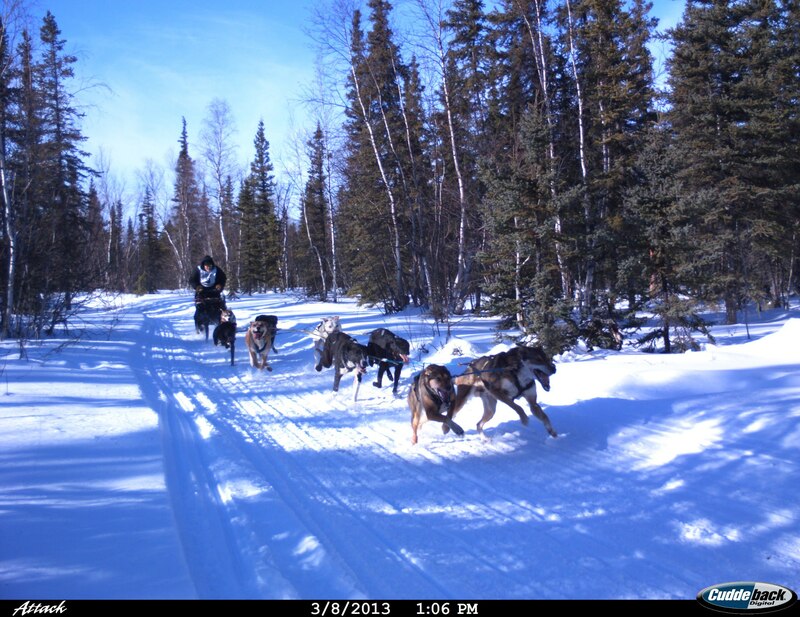 It is great to see how the youth are discovering dog mushing. There are many valuable lessons to be learned from taking care of dogs, training them and taking on life’s challenges. They are catching the dog mushing fever! George Attla II raced in the Cue Bifelt Memorial Dog Race in Huslia in 2013. Photo by Al Yatlin, Sr.
George Attla, Jr. is Athabascan and is from the northwest community of Huslia, Alaska. The legendary open-class sprint dog racer has won more Fur Rendezvous World Championships (10 wins) than any other musher to date. He won eight North American World Championships and nine International Sled Dog Racing Association unlimited class metals. His book, Everything I know about Training and Racing Sled Dogs, is still considered the musher’s bible. His life story became the subject of a film, Spirit of the Wind and a book of the same title has been published. In 2000 he was awarded the Best Musher of the 20th Century. In 2007, he was inducted into the first Alaska Sports Hall of Fame. 2008 marked his 50th year of competitive sled dog racing. In April 2011, he won the Bergman Sam Memorial Koyukuk River Championship in Huslia. Find more information about George Attla, Jr., please visit: http://attlamakingofachampion.com/. I was talking to my mom, Eleanor Yatlin, recently about my late Grandma Lydia Simon. She mentioned that Millie Moses of Allakaket was my late grandmother’s siwogilaah. 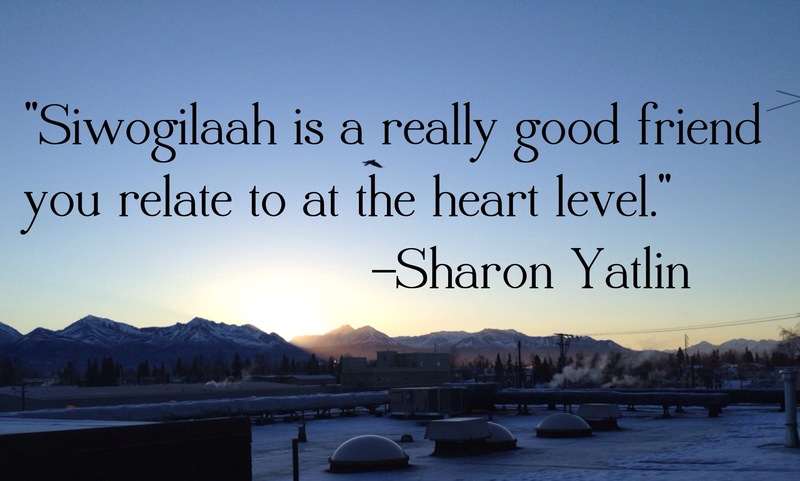 Siwogilaah means special friend or mentor in Denaakk’e (Koyukon Athabascan). My aunt Irene Henry of Allakaket says, “It’s like a very, best friend ever.” Siwogilaah friendships are sometimes made because the parents or grandparents were friends. Another way this friendship can be formed is if someone gives a special gift. It could have also started because you were there in a time of need. In Denaakk’e, siwogilaah is pronounced “se wo gil agh”. It means special friend or mentor. Siwogilaah is different from gganaa’, which is the Denaakk’e word for friend. Mom said that Helen Attla of Hughes was also a siwogilaah to my late grandma. I think Helen tanned a moose skin for her. The late Laura Mark of Huslia was a siwogilaah to my mother. Mom said, “Late Laura taught me how to tan beaver skin and cook.” Mom was encouraged to go to late Laura to ask her advice. It was great for my mom to depend on someone and to learn how to do things. Aunt Irene and I talked about common Athabascan beliefs and traditions still in use today. Some common Denaakk’e words are being used today, like basee’ (thank you) and hutlaanee (taboo). Irene says, “All the kids around here say anas baaba if they drop food. It is hutlanee for us to waste food.” I am not sure the tradition of siwogilaah is being continued as much as it was 30 years ago. Millie Moses says she has two siwogilaah. The first was the late Lydia Simon of Huslia. The second one is Eliza Jones of Koyukuk. Late Lydia Simon was a like a grandmother to Millie. Late Lydia told Millie she reminded her of her late grandmother Cesa. Late Lydia once gifted Millie with a silver ladle and beaded slippers. Millie visited late Lydia whenever they were in the same places together. During potlatches or cover dishes, Millie made it a point to make sure late Lydia got some food and would deliver it if needed. Years ago, Millie tanned a moose skin. At the time, Eliza Jones was teaching Denaakke’ in Allakaket. Millie gifted Eliza with a part of the tanned skin. That was the only moose skin Millie ever tanned, and she said giving it to Eliza was one of the best things she has ever done. Eliza was touched by the gift. Since then, Millie and Eliza have been special friends. Eliza has gifted Millie with salmon (jarred and smoked). Millie makes a point to visit Eliza whenever they are in the same place. I don’t know of too many younger people who are continuing this tradition of having a siwogilaah, but I know special friendships continue. My sister, Sheri, has good friends that she considers siwogilaah. The younger generation can certainly benefit from this type of friendship. It is really about survival and friendship. I’m still learning what it means.